THE UK’S friendliest and MOST COST EFFECTIVE office RECYCLING SOLUTION. Why Should I Use RCS Recycling? Racking Shelving Cabling etc. We will remove these items from your premises and take them away for secure, GDPR recycling. All of the recycling that we undertake is carried out in an environmentally responsible manner and all data contained within any of the devices is securely GDPR destroyed along with the consumables. We provide GDPR certification as proof of secure disposal. If we haven’t mentioned something above that you require removing and recycling then get in touch to discuss your requirements. The chances are that if it is in your business premises, we can recycle it! Hard disk destruction with GDPR destruction of Hard Disk and Data storage devices. Disk Destruction At RCS Recycling we have a portable 12-tonne disk press capable of destroying 4 hard disks at a time. The process involves snapping the disks in half which destroys the internal platter of the disk. The two pieces are then shattered into small fragments. The next step in the procedure involves using a 120-tonne static machine to further fragment the remaining pieces. Static or off-site disk destruction The process used in the destruction of disks conforms to GDPR, SEAC and MOD Data destruction standards and we will provide Certification of Secure GDPR Disposal for your records. We welcome our clients to observe our portable crusher in action. Additional services available If required we can record the hard disk model and serial numbers. Please get in touch to discuss any specific requirements you may have and we will do our very best to help you. Our Methods of Disposal Following destruction of your disks, all materials are granulated and recycled under the WEEE and GDPR directives using eco-friendly methods. All Hard Disks and Storage Devices are securely destroyed by granulation to DIN 66399 P-4 Shredded Standard. Hard disks and storage devices are granulated into SEAC/MOD/GDPR standard 3mm chips using our 120-tonne static shredder. Media tapes are incinerated to GDPR standards. Storage media plastics and plastic TFT/CRT/TV screen bezels etc. are ground into pellets. They are then re-used in plastic extrusions and garden furniture. Glass CRT’s, Fluorescent tubes, light bulbs Fridges Freezers etc. are de-gassed with the end caps removed. The granulated waste is then added to road aggregate. Chairs are recycled and the soft materials are recycled into insulation and all metal is separated then shredded and sent back into the supply chain for re-use. GDPR disposal of Telephones and Communications equipment. At RCS Recycling our telephones disposal service includes the disposal and GDPR compliant recycling of all telephone systems, handsets, switches, routers, consumer units and mobile phones. Rather than just throwing away your old phone handsets or wondering how to best dispose of that mobile phone, we will come to your premises and collect your unwanted equipment then take it back to our plant for the safe disposal and recycling to GDPR standards. In the case of mobile phones, we will also responsibly dispose of the batteries. As business owners, you are legally required to recycle unwanted telephony products via a registered, GDPR compliant waste management company. All goods will be recycled in accordance with GDPR and Waste Electrical & Electronic Equipment (WEEE) directive (2002/96/EC). This means that more responsible disposal leads to less waste that gets buried in the ground and you get peace of mind that you are acting within the requirements of UK law and GDPR standards. You will also be provided with certification of collection and GDPR disposal for further evidence that you are fulfilling your requirements as a responsible business owner/manager. To find out more about our telephone disposal service and how we can help you, please get in touch. We understand your corporate and social responsibilities RCS Recycling provide alternatives to the traditional disposal route of landfill. We can offer to donate unwanted items that have not reached their end of life to worthy causes including local schools, UK charities, and community projects. Any unusable items are broken down for spares or recycled responsibly. RCS Recycling disposal service is cost effective, reliable, friendly and easy to work with. And we are happy to provide a free site survey to assess your needs. If you are looking to dispose of unwanted office furniture, RCS Recycling offers an environmentally friendly way to dispose of it – we aim for 0 percent landfill. Whether you need office Chairs, Desks, Storage units, Boardroom Furniture, Partitions, Safes or filing cabinets or general clutter cleared, call us and see how we can help you and help the environment. We separate out the various waste streams in the materials we clear, making recycling far easier and more efficient. 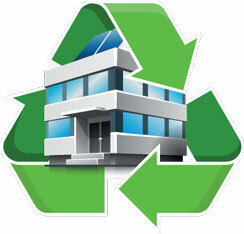 We are proud to recycle 96% of the furniture we clear from offices. Environmental reports We provide our clients with Certification of Disposal and a detailed environmental report. This details the quantity and material removed, the recycling facility it was taken to, the percentage recycled and reused. We calculate the carbon saved as a result, which can easily be incorporated into our clients’ own CSR data and reports. RCS Recycling will collect, Fridges, Freezers Air Conditioning units and any other domestic or commercial white goods. When they arrive at our processing plant, all fridges and freezers are safely degassed. Oil from the compressors is safely removed and processed. The shell is put into a special designed machine were the metals and plastics are ground up and separated, while the foam from the fridge is removed degassed and separated into bags for recycling. This is just one process designed for the recycling of Waste Electrical and Electronic Equipment under the new WEEE Directive. FLUORESCENT TUBES Fluorescent Tubes contain in general 94% Glass, 4% Ferrous and Non ferrous metals, and 2% Phosphor Powder, It is within this phosphor powder that the most hazardous element is contained- Mercury. Some 100 million lighting tubes (about 20,000 tonnes) and 100,000 tonnes of CRT glass are scrapped each year in the UK. Currently these are usually shredded and dumped in landfill sites. The Environment Agency has therefore determined that Fluorescent Tubes are now classified as Hazardous Waste in England and Wales, as Special Waste by the Scottish Environmental Protection Agency (SEPA), and therefore should preferably be recycled or if absolutely necessary, taken to specific landfill sites which can cater for mercury bearing wastes. The actual number of sites in the UK that can cater for such waste is very limited and, given high transportation and disposal costs nowadays, this makes recycling of your Fluorescent Tubes the most economical and environmentally friendly option. RCS Recycling separates the individual components of Fluorescent tubes and recovers them for recycling or re-use in a variety of industries. Apart from the Environmental aspect to Recycling Fluorescent Tubes, it is also very important to the health and safety of your employees, an employee for example attempting to dispose of a Fluorescent Tube in a skip, not only would he be condemning the whole skip as Hazardous Waste, with costly consequences of the safe disposal, but he would also be exposed to the potential dangers of broken glass and also the inhalation of small amounts of toxic materials released as dust and vapour. We provide Certification of Secure Disposal (free of Charge) for your records Call us today with your requirements and see how RCS Recycling can help you! BATTERIES RCS Recycling Limited recycle any batteries, call us with your requirements! Types of batteries commonly recycled are: Lead acid batteries (Pb) (rechargeable battery, some UPS systems, some rechargeable torches and other equipment) Nickel cadmium batteries (NiCad) (rechargeable battery, used in some UPS systems, variety of electrical equipment including mobile phones, rechargeable torches, computers etc) Nickel metal hydride batteries (Nimh) (rechargeable battery, common use in mobile phones and computers) Lithium-ion batteries (Li-ion) (best rechargeable battery around at present, common use in newer mobile phones and computers) Should you have any type of material not listed please call us and we will be pleased to help… To receive a quote for Environmental Recycling in London, Slough, Windsor, Maidenhead, Reading and all around United Kingdom, contact RCS Recycling to get the process started. Secure GDPR Disposal of Confidential Documentation. Under the Data Protection Act of 1998 it is a legal requirement that any data about customers or employees is effectively destroyed once it is no longer used. In order to achieve this, you need the services of a good, confidential and GDPR compliant waste disposal service. At RCS Recycling we are fully versed in UK data protection laws and GDPR standards. We are fully aware how critical it is that data is safely destroyed. Our confidential waste shredding service offers complete peace of mind that your confidential data destruction is handled correctly. Recycling Following the GDPR destruction of your data, you want to know that your shredded materials are processed in an environmentally friendly way. Where possible we recycle all materials giving an added layer of security. Security Once destroyed, we will issue a GDPR certificate of destruction. This offers proof that all data has been destroyed in accordance with UK and EU GDPR law. At RCS Recycling we are members of the National Association of Information Destruction, the regulatory body that promotes the correct GDPR destruction of data. In addition to this all of our employees are background checked to ensure that your information doesn’t end up in the and our employees all wear uniform and carry ID. Tracking devices are installed in our vehicles so that we can be sure that we know where our employees AND your confidential data are too! Licensed and accredited We are ISO accredited, hold an Environment Agency Waste Carriers Licence, and an Environment Agency Waste Exemption Certificate. Our commitment to GDPR, security and data protection is paramount and transparent in everything we do. We offer solutions for every size business. To find out more contact us. Printer Cartridge Recycling made easy! Unfortunately, it is estimated that only around 30% of the world’s printer ink and toner cartridges are recycled. This means the rest find their way into landfill. Each year, in the UK, we dispose of 55 million cartridges. That’s enough to fill 70 Olympic sized swimming pools. At RCS Recycling we are committed to recycling ink and toner cartridges with our printer cartridge disposal. With no hassle to you this provides our customers with a complete peace of mind solution for the recycling of your used or surplus printer cartridges. For large or small businesses Whether you own a small business or manage the operations of a large corporation like a bank or public-sector business, we can provide effective collection and recycling services. However big or small your business, we can tailor a solution. Safe disposal and recycling We will then arrange for the safe disposal and recycling of all printer ink and toner cartridges to ensure that they don’t end up in landfill. To find out more about how we can help you please get in touch to discuss your requirements. Disposal of General Clutter including cardboard and Packaging Materials (Most offices have a room or cupboard full of these materials) If you have just read the previous line you are probably nodding your head in appreciation or groaning at the thought of that cupboard or storage room that needs sorting. Empty packaging, boxing, old records… the stuff just gets stored away out of sight with a procrastination to sort it later. Removal and recycling of general clutter If only there was a magic solution to resolve the issue and give you back that space that you could put to better use. Well thanks to RCS Recycling there is. If it is in your office, it is likely that we can recycle it. Whether you have lots of old cardboard packaging and bubble wrap or whether you have old computers and chairs in there, we can take it away and recycle it. If there is any confidential waste amongst it, we can arrange for the secure destruction and recycling of these materials. We do the work for you We do the hard work for you. Just tell us what you want us to remove and our team of experts will handle the rest. They will come to your offices or premises in uniform with identification and safely remove any unwanted items. They will then be returned to our plant where will manage the effective destruction or recycling of these products. All of our services are designed to reduce stress and hassle for you, while having a positive impact on the environment. Call us today to find out more. We professionally dispose of all IT Equipment including telephony and communications equipment, also fluorescent tubes, photocopiers, refrigerators, general office equipment and furniture. In fact, we can recycle anything within your office to GDPR standards! RCS Recycling provides secure GDPR and environmentally friendly disposal of redundant, obsolete or unwanted IT and office equipment. We provide ‘green’ recycling to the highest European and UK Environment Agency standards, waste electrical and electronic equipment (WEEE) directives and GDPR standards. Complete coverage of the UK. RCS Recycling has been established since 1989 and offers complete coverage of the UK. We have offices conveniently situated in Birmingham, Windsor and Leeds. We are Environment Agency registered to carry hazardous waste and provide all clients with the correct Environment Agency paperwork, in addition to a detailed, GDPR compliant breakdown of all equipment collected for your records. No job is too small – please contact us, to see how we can help you. Servers, UPS Back Up Units DAT Drives, Cabling and Rackmount Equipment and Racking Shelving etc.